If you’ve been a follower of our blog for a while, you may have seen this room made over before. This is this room’s 4th, yep, 4th makeover. I have learned so much about what works for this space (and our family!) and what doesn’t. I FINALLY love this room. 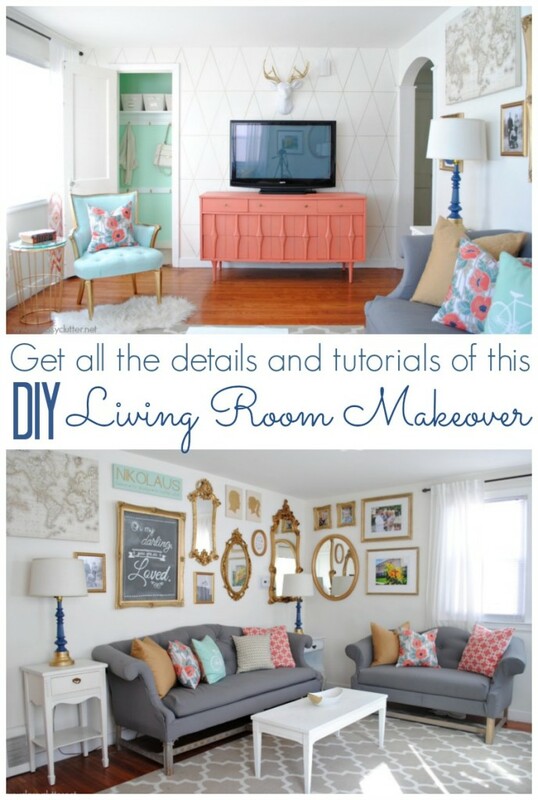 I love it because it totally reflects my style and nearly every element of the room was a DIY done by yours truly. I’m talking, the wall paint, refinished floors, curtains, ALL of the furniture, including the sofas and many of the accessories were all made by moi! From 2011, when we moved in and had zero decor (and no decorating budget!) This room has come a long, long way! Since moving in, I have painted the room twice. 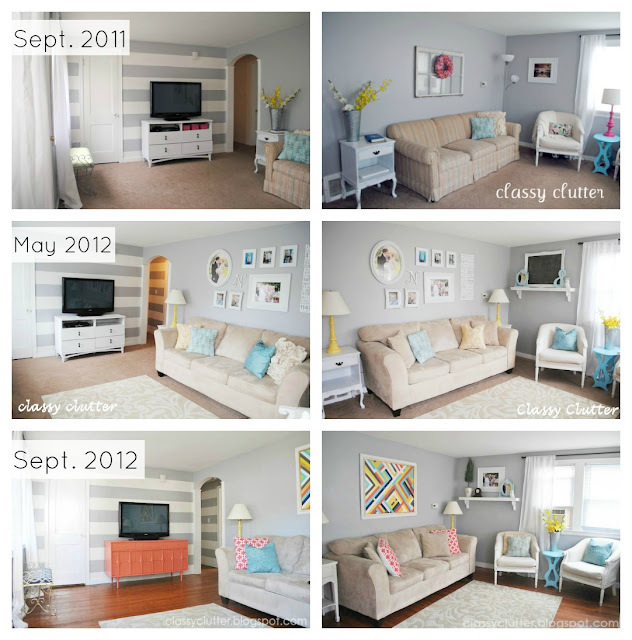 Once a pretty grey (Glidden – Pebble Grey) with a striped accent wall and hallway. Now, we have a crisp white (Behr – Swiss Coffee) room with a Mandilicious, Vintage Revivals inspired gold sharpie accent wall. It’s funny but I can totally see my style shift and I finally figured out what “my style” is. 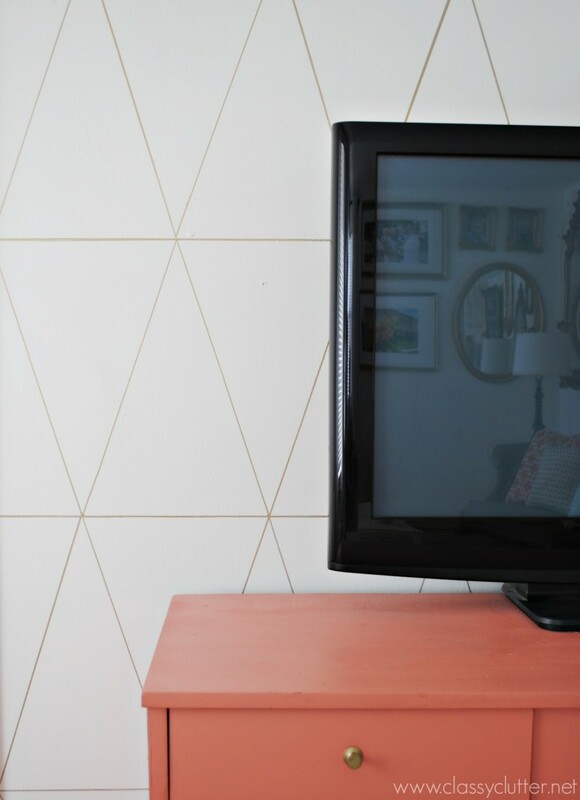 In 2012, I refinished the wood floors that were hiding beneath the beige builder grade carpet and painted my favorite yard sale find to date, the Coral TV Console. 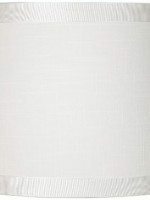 The paint color is Sherwin Williams – Emotional with a tiny bit of white to lighten it up just a little. On the other side of the room, I painted both end tables and the coffee table white to keep it neutral. 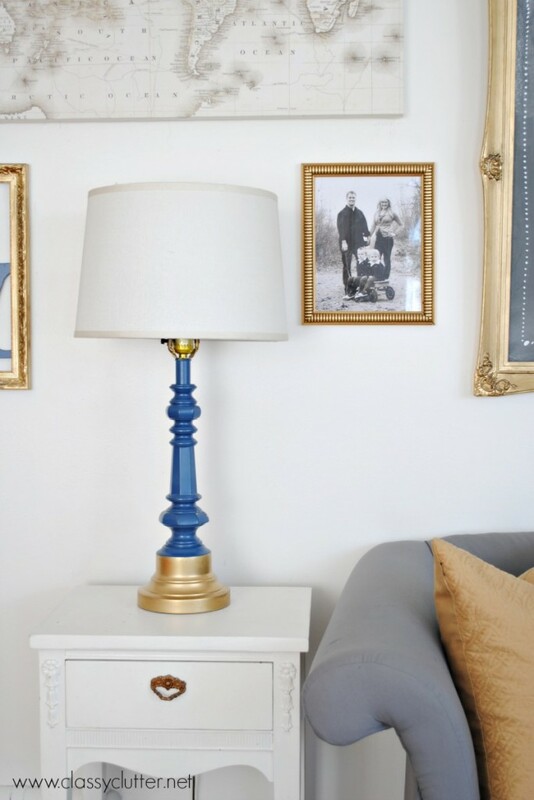 The lamps were spray painted with Krylon Navy spray paint and Rustoleum’s Gold Metallic. The lamp shades are from Target. The area rug is also from Target. It’s a light color but has held up well to spills, kids and snow being tracked in the house. 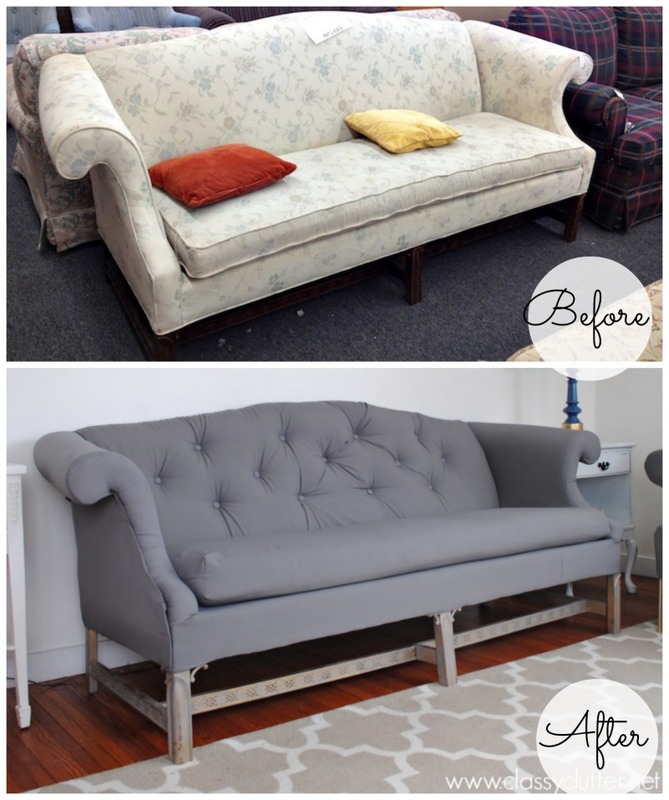 I tackled one of my biggest DIYs ever and reupholstered and tufted these thrift store sofas and painted the legs gold then dry brushed them with a grey to distress it and tone down the metallic gold. I am in love with the look of these and they’re super comfy! Another fun project I did was put together this Gold Glam Gallery Wall. I love that it’s carried over past the corner and goes onto two walls. Most of the frames and mirrors are thrifted with one exception. I framed some family photos, created these hand painted DIY family silhouettes of my husband and I, made the personalized “Nikolaus – forever, for always, no matter what” sign for our family, added the map (a clearance steal from Target!) and some fun prints to the wall. I love how it all came together. 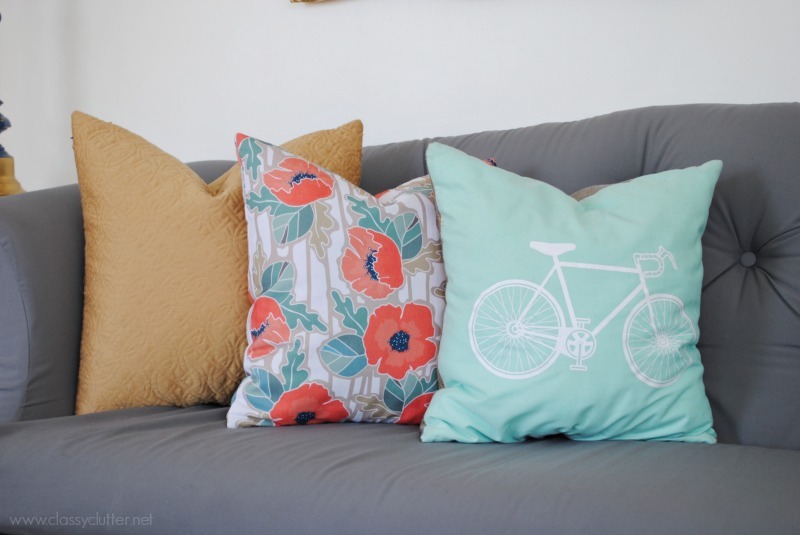 I’m a sucker for cute throw pillows. The gold ones are from HomeGoods and the floral is from DecoMod Walls. The mint bicycle one has gold faux snakeskin fabric on the back and for the front I used mint cotton fabric. 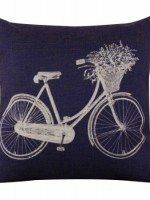 I used my Silhouette and some white heat transfer paper to make the cute vintage bicycle. I love the little quirkiness it adds! 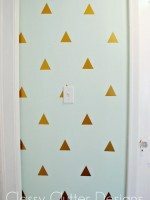 If you look past the gallery wall into the hallway, you can see my mint hallway with another gold mirror and gold triangle vinyl decals. I’ve already been asked where I got them after posting a photo on instagram so I added them to my Etsy shop! You can purchase them here if you’d like! 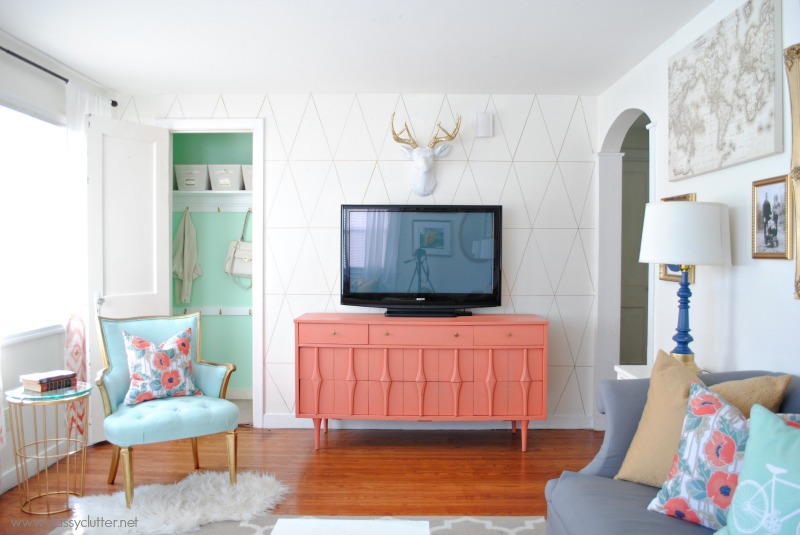 If the door is open, you can see my super fun mint coat closet makeover. That closet makeover was a long time coming and has helped tremendously in keeping this room tidy… most of the time. 😉 The mint color is a mix of Behr – Canton Jade and Tropical Dream. It’s the perfect shade of mint. 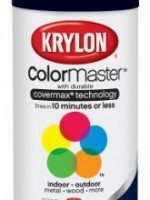 I used the same paint color in the hallway when I painted over the grey and white stripes. For the little sitting area, I reupholstered this $5 yard sale chair into the best chair ever. I love it so much! Mint and gold are just perfection. 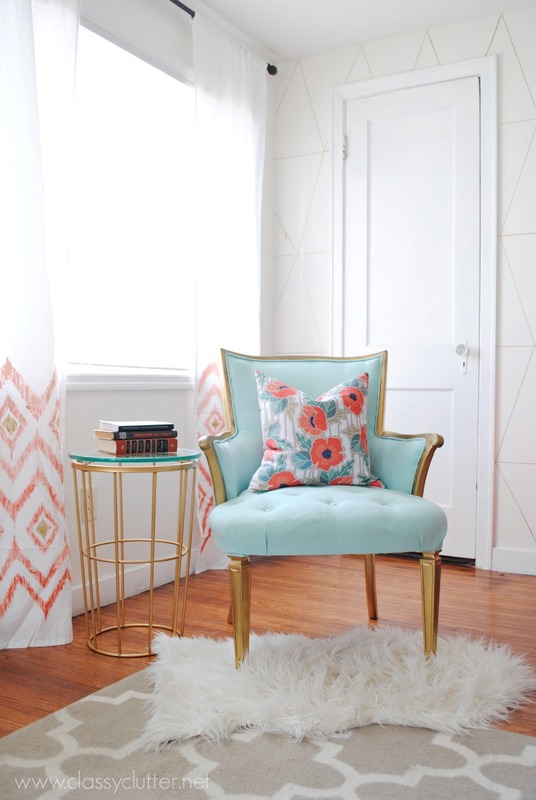 The rug is from HomeGoods and the side table is from Target. I love how the glass almost has a mint tone to it so it matches so well! See the curtains peeking behind the table and chair? 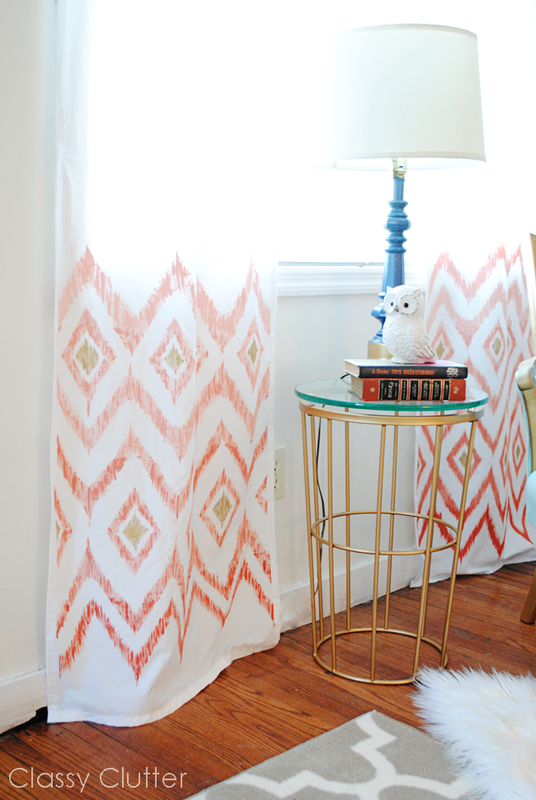 I made these ombré, coral and gold, ikat curtains for $5 from a twin sheet! I couldn’t find the right fabric so I hand painted the ikat design! You can find the full tutorial here. Wow! Okay, got all that!? 😉 This is my favorite room in the house and it was chalk full of DIYs, re-DIYs and tons of ideas. Some of which worked, some didn’t. 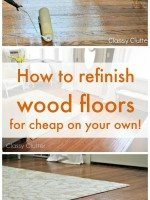 I love the decorating process and I’m a DIYer for life! For now, I’ll sit back and enjoy this room until we move next year! I am submitting this makeover to Creating with the Stars 2014! If you liked this, please head over and click on this project on the link party (#245) to increase our chances of being chosen! Savannah and I are die-hard DIYers and this competition would be so amazing for us to be a part of!! Head over and check it out here. 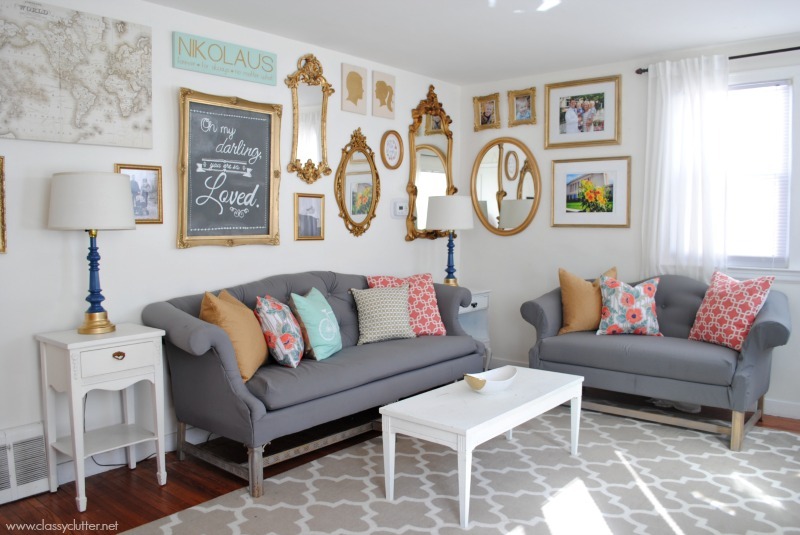 Leave a comment and tell them how much you love this room and the Classy Clutter girls!!! We are entry #245 in the link up!!!! Please head over and click on the project to help us earn a spot! If you love this room, please pin it and share it! Oh my gosh I love this so much. This is gorgeous! Just love it! All of the personal touches and the custom upholstery, you’re very talented! I do LOVE LOVE LOVE it- everything- so fresh and white and tons of hits of gorgeous color and gold and all kinds of amazing detail….I could go on and on in one of the longest run on sentences ever I think. Seriously amazing and stunning job Mallory and I am heading over to share it on my G+ and Facebook/Twitter too!! Love! 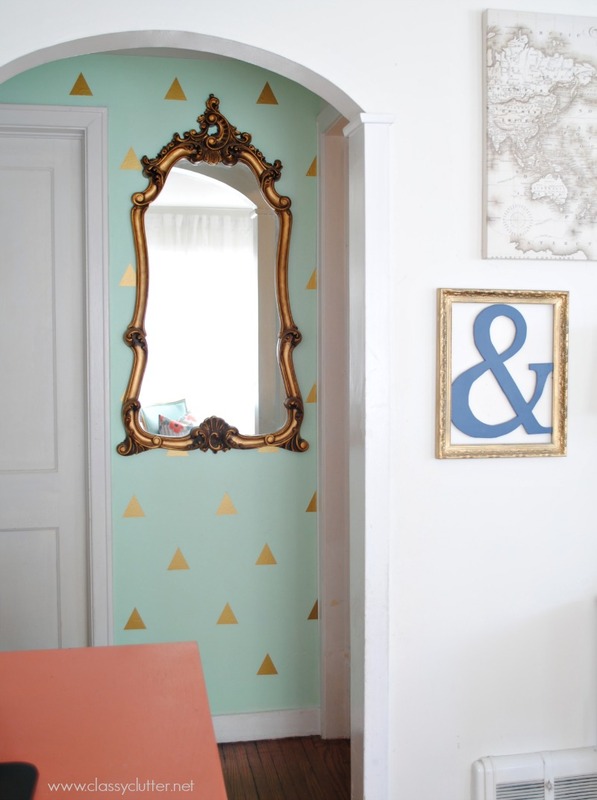 I love this room, especially those gold mirrors/ frames! Oh my goodness! What a stunning room! I think my living room needs a bit of a face lift. 🙂 Thank you for sharing and inspiring! Awesome makeover, i just fell in love with it. I will take some of these ideas if you don’t mind. I found this on Pinterest – WOW – Love all of it!!! I am your newest bloglovin’ follower!! Great inspiration! 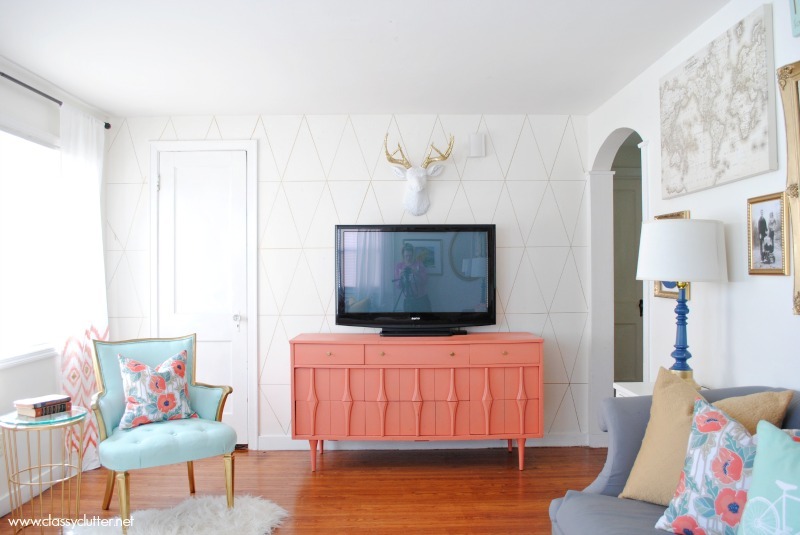 Ohmygosh, I am in LOVE with your gallery wall! Well done! The whole room looks great! This is on so many levels my favorite room I’ve seen in a really long time!!! It’s perfect! I don’t even know what I like the best. 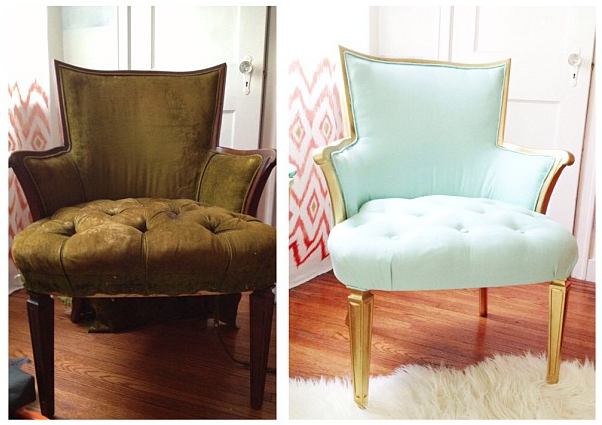 The furniture makeovers are outstanding. Great job! SO, SO, SO in love with this room! Everything is totally awesome! Congrats on getting in at EC2!! Can’t wait to see what you do! This is BEAUTIFUL. We have the same decorating style. Amazing job. 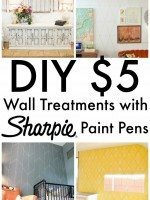 I love the color scheme and the wall treatments, especially the one in the hallway! 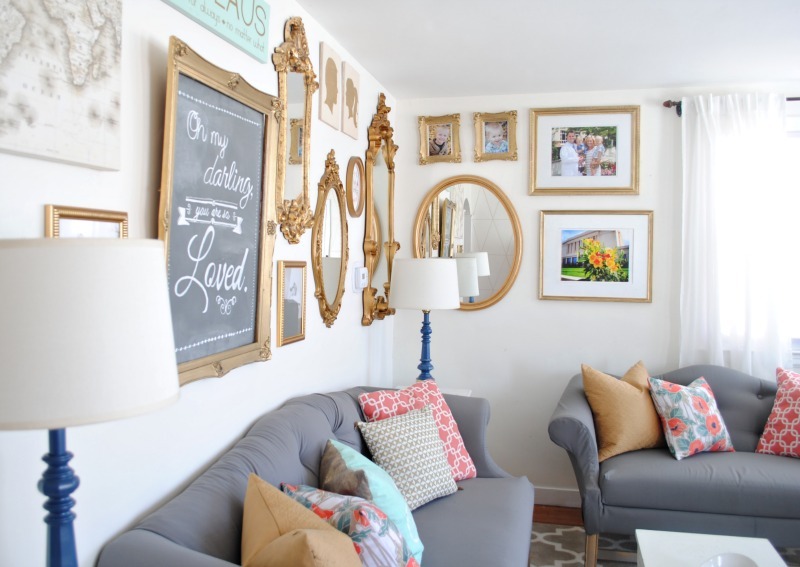 I love the gold gallery wall-really adds sparkle. Thanks for sharing all! SUCH a gorgeous space!!! So fun to look back on the changes through the years too! Excited to share this tomorrow with my favorite posts from this week at http://www.makingitinthemountains.com! Wishing you a fabulous weekend! Love the gallery, specially the mirrors. May I ask where did you get all your mirrors at? Almost all of them were from thrift stores. Some are spray painted gold and some came that way. Hobby Lobby also has a great selection of mirrors! Spectacular!!! You are so clever and creative. I LOVE it!!! Seriously beautiful and very inviting. Love everything about it! Thanks for sharing! I linked to this post from my newsletter (none of your photos were used)! 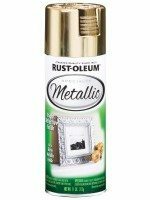 I’m considering using the gold spray paint on dresser knobs and the handles on a TV console. The hand painted ikat print is genius!